LiveMe, the fastest-growing independent live broadcasting app in the United States, has entered a deal with Musical.ly to provide a new home for users of Live.ly, Musical.ly's standalone live streaming app that was recently shut down. Under the new agreement, Live.ly will direct its users to LiveMe by prompting users and new sign-ins with an in-app message encouraging them to join LiveMe for their live streaming needs. The message will also provide a direct download link to LiveMe on Apple and Google Play app stores. Live.ly users can alternatively continue to enjoy diverse, high-quality live streaming content on LiveMe, the best destination for creative short videos and give live broadcasters. Broadcasters can leverage LiveMe's robust live streaming capabilities to drive deeper engagement and give users the best possible live viewing experience. 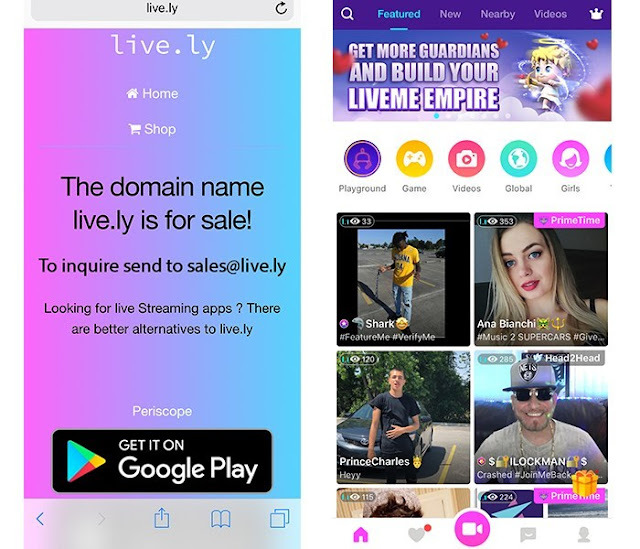 As it opens its platform to the Live.ly community, LiveMe will help creators explore new opportunities and increase their earnings potential as a lucrative alternative for many new broadcasters joining the app. Since LiveMe launched in 2016, the app's virtual gifting platform has been the driving force behind its success as one of the 'Highest Grossing Social Media Apps' on the app charts, generating more than $30 million in revenue for creators. The transform comes on the heels of LiveMe's recent announcement of its Broadcaster Development Program, a newly launched initiative to support emerging creators across all creative talents and backgrounds. This new program will provide the influx of new broadcasters with the opportunity to further develop their broadcasts. The program selected applicants' financial incentives, dedicated talent managers, ongoing training and support, and prime exposure on LiveMe.